This Explains Everything edited by John Brockman | Blah! To arrive at the edge of the world’s knowledge, seek out the most complex and sophisticated minds, put them in a room together, and have them ask each other the questions they are asking themselves. As part of this goal to ask and answer questions, each year the Edge contributors propose and vote on a question that they then each try to answer. This has been going on for a few years now and each year the answers are collected into a book, edited each year by John Brockman. 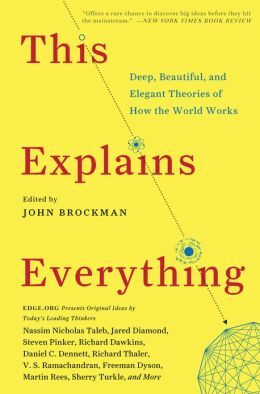 The latest book, which is also the first one I read, is called This Explains Everything and collects the answers to the question: What is your favorite deep, elegant, or beautiful explanation? The book collects about 150 answers from a large variety of people. Each answer is 1-10 pages and vary from choosing Darwin’s Theory of Natural Selection, to Maxwell’s Equations (what I personally would have chosen if I were part of this), to more modern cutting edge science that, to be honest, is sometimes a bit hard to follow. And it isn’t all science, there are poets and musicians who also contribute their answers. As I mentioned, the best thing about this book was just being exposed to ideas beyond what I encounter in my daily work. Not all of them are things I can personally use in my work, but they show some of the cutting edge work being done in other fields. I greatly enjoyed the book and have already downloaded my next one from this group, This Will Change Everything. Pingback: What is Your Dangerous Idea? edited by John Brockman » Blah! Pingback: My Elegant Explanation » Blah!